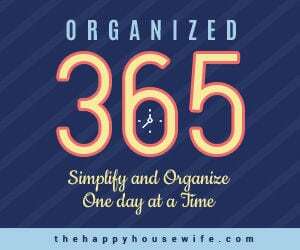 The following is a post from contributing writer Angie. I spent most of my days as the mother of infants in small apartments or single story houses. Our changing table was always within an easy distance to get to at all times. I realized recently that having a larger home and an infant can pose an interesting dilemma — sometimes the baby supplies can be far away! One of my friends, who recently gave birth to her seventh child, has a house with a frequently used basement, as well as two stories. While she has a central location on their main floor for most of the things that the baby needs, she would be walking the stairs often to make it to that location, as bedrooms are upstairs and homeschooling takes place in the basement. It is possible, of course, that given my history of smell dwellings, this is not an earth shattering idea for those mothers of littles who have large homes. However, I was thoroughly impressed when my friend was showing me homeschooling items (in the basement) and needed something for the baby. When setting up a baby supply box for yourself, keep in mind other items that might be necessary for your baby, but also remember that this is just a small box to grab from quickly. It does not need to be filled up like a diaper bag when you are headed out for the whole day. 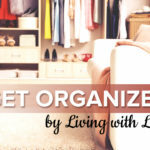 You will still be able, of course, to go to the spot in your home where you keep the majority of your baby’s items. It’s not enough to put the box together, of course. In order to actually enjoy the benefits of having a baby supply box (or multiple boxes, depending on your home’s layout and the logistics of your day), you’ll need to commit to regularly restocking your baby supply box. When your baby is younger, you will be restocking the box more often, but the frequency will decrease as the baby gets older. 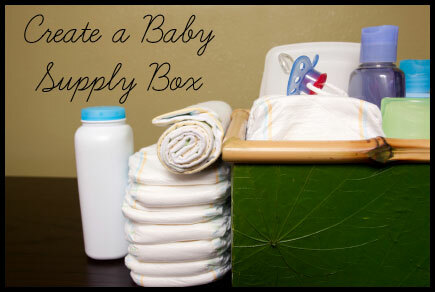 If you have older children, you can consider making it a chore for them to help you keep the baby supply box filled. For readers, a simple written checklist on the box’s top will be sufficient. For younger children, you can include a picture checklist in order to allow them to be successful in helping Mom take care of the baby. Are there any items that you would include in a baby supply box that aren’t listed above? Oh! Hand sanitizer — that’s a really good one! I lived in a tiny one bedroom apartment when my daughter was born, but I used the same concept. I used a gardening tote bag for all the diapering needs (other needs, as you mentioned were near enough at hand in the small home). The center contained a small foldable changing pad, several diapers, wipes (the box helped separate things and hold up diapers). The outer pockets (menat for trowels and seed packets) contained lanolin that I used for rash, toys to distract (entertain) baby during change, baby comb and brush, thermometer, and other small things that were just easier to hold in the pockets than any other place. It was lightweight and easy to carry from room to room. I use another diaper bag, a small one or tote. I would add the cell phone, house phone, to the bag. I do this when we go outside. I have an aunt who lived in a small place too and she used her diaper bag the same one she would carry when she left home. It was the simple square bottom type that stood on its own. for Formula moms I (we have to use it 🙁 , I would put bottles ready with the water and powder in a container in it also.